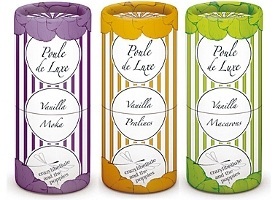 The Poule de Luxe collection from Crazylibellule & The Poppies is a series of solid twist-up perfumes centering on vanilla notes. The line, as a whole, is easy to like: the packaging is adorable and convenient, and best of all, they are reasonably priced at $16 for 5 gr. Their Encens Mystic easily qualifies as my best bargain find of 2006. The Poule de Luxe collection does not have anything that will displace Encens Mystic as my particular favorite, but it is high on the "fun" factor and bound to find fans with vanilla freaks. My favorite of the bunch is the Vanilla Moka (shown), which features notes of dark chocolate, cocoa bean, sandalwood, mocha, coffee liqueur and musk. Years ago, I used to love a particular kind of coffee hard candy, and I've been going crazy the last few days trying to remember what it was called, but at any rate, Vanilla Moka smells exactly like it: dark coffee with just a touch of chocolate, sweet but not overly so. The dry down gets woodier, paler and creamier, and has a nice comfort scent vibe, assuming you love the smell of coffee. The lasting power is not quite so good as the Encens Mystic, but at the price, it is hard to complain, and insofar as you can just throw the tube in your purse or pocket, touch ups are not a problem. Vanilla Macarons has almond, amaretto, cedarwood, sandalwood, vanilla, musk and amber. The cedar is surprisingly strong in the opening; if you don't like cedar, stay away. If you do, this is an interesting woody fragrance with the almond more bitter than not. It is far less sweet than the name and the notes might imply, in fact, it is not really a gourmand scent at all despite the almond and amaretto. Once it settles, the woods are very nearly bone dry, almost smoky, with just a touch of vanilla to sweeten things up, and after a half an hour it smells like incense faintly scented with almond. Very nice, and although the Vanilla Moka was more immediately attractive, this might be the one I will end up wearing frequently. If you're looking for a more straightforward foody vanilla, Vanilla Pralines might be the ticket. The notes include caramel, hazelnut, pecan pie and and musks, and it is just what it sounds like: nutty caramel pie, much sweeter and more vanillic than either of the two discussed above, and therefore, less to my personal taste. I did not get to try the Vanilla Lemon Pie, but it sounded nice so please comment if you have smelled it. Coming up over the weekend, reviews of Voluspa home fragrances and Ava Luxe body lotion, then next week, more CrazyLibellule & The Poppies plus reviews of the new CK IN2U scents. I am planning to spend the weekend with the Divine Alcoves so can only give you a quick impression of Dans Tes Bras — it is spicy peach (but very soft, not overly fruity or sweet) with a soft amber-patch dry down. Reminds me of something else that I can't place yet. Not my sort of notes so I don't love it, but very nicely done. Fig Tea is lovely, and I never understand why it isn't more widely loved, but then PdN is so under-rated in general. Starts with lots of bergamot, then something sort of like anise, then a fruity herbal tea with osmanthus. There is fig, but not tons of it, and this may be why it has never found a fan base — it isn't what you'd expect from the name. Very good lasting power in comparison to some of the other summery PdNs. Thanks, R, can always count on you! I sprayed a *lot* of the PdNs onto strips at the Paris store but then lost track of which was which. There was a very lovely floral oolong-like tea scent left on one of the strips, and my guess is that it was this one, but the MUAers pooped on it so that I doubted myself. Which is your fave Divine Alcove? The iris one? I can't think of any other PdN that would recall a floral oolong, so I think that must be it. It is a great summer scent. Why is PdN not more adored? It is really a mystery to me. Some say it is the packaging, but I can think of lines with much uglier packaging (and uglier fragrances) that get way more love. Robin, could you thinking of Werner's Coffee Nips? I must have eaten my weight in them when I was in college. As for PdN, I'm wearing Sacrebleu today, by chance. Sweet and comforting with all this threatening rain. And hey, you smell nice! This is the only line where I'm happy about multiple releases. Love the pricing. However, since I'm not much of a vanilla person, I wasn't planning on even investigating these, but I'm suddenly thinking that I've got to place an order for that Vanilla Moka. I adore coffee and it sounds divine. And I'm also mystified as to why the PdNs aren't more popular. I think the quality is incredible for the price and I truly admire even those which I don't wear. But Fig Tea is definitely one I wear. Pure deliciousness in summer. Well, I have been reading your blog quietly for months now, terrified to post until today. An amazing conflagration of events has happened, namely 1) I just ordered Vanilla Macarons, hoping for that perfect touch of almondy cedar and 2) I am wearing PdN Eau d'Ete for the second day in a row. I know it's a bit premature, but I absolutely hated this back in January and was floored to find I adore it now that the snow is melting! Was loving on Encens Mystic last week during the Nor'easter, though. Robin, thanks for such a wonderful blog. It really is something I look forward to reading every day! Fig Tea is so wonderful, and gets so little attention, so glad to hear it has another fan! Sometimes I actually wonder if they'd be more loved if they were more expensive — the really high priced scents seem to get more attention even if they aren't as good. If you love the smell of coffee, I really do think you'd like the Moka. I'm not much of a straight-up vanilla person either, but that & the Macarons are well worth trying. Eau d'Ete is a wonderful scent and one of my summer favorites.